Night fighters were aircraft employed to destroy other aircraft in aerial combat at night. This was a considerable challenge early in the war, when few fighter pilots were trained for night operations and radar technology was not yet developed to allow a night fighter to locate its prey in the dark. However, as the war progressed, airborne radar was developed that could be carried in a two- or three-man aircraft and allow it to locate enemy bombers. These could then be destroyed, typically using oblique-firing fixed cannon that allowed the night fighter to approach its target from below and to the rear. The user of tracer rounds was usually avoided to avoid giving away surprise or spoil the crew's night vision. Likewise, the exhaust ports of night fighters were heavily shielded even though this affected engine performance. The U.S. Navy tried a somewhat different approach beginning in late 1943. Night combat air patrols consisted of a radar-equipped Avenger accompanied by a pair of conventional Hellcats, with the Avenger acting as an airborne controller to direct its fighters onto the enemy. This required rather careful coordination, and naval ace "Butch" O'Hare was lost on such a patrol when he was caught in the crossfire between a "Betty" and his own lead Avenger. Later in the war, radar was developed that was small and simple enough to be operated from single-seat fighters. This allowed such fighters to operate effectively on their own. Japanese night fighters were generally hampered by a lack of effective airborne radar. However, 204 Air Group at Rabaul sometimes attempted night interceptions using searchlights for guidance. A number of Japanese aircraft types were modified in small numbers for night interception, generally by adding oblique cannon. Night fighters were much disliked by carrier flight operations officers, since night flight operations were a considerable added strain on already overworked flight deck personnel. The decision was eventually made to designate specific carriers, and eventually entire task groups, for night fighter operations. Almost all night fighters were special adaptions of existing designs. 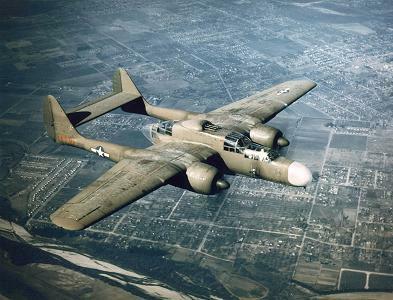 The exception was the P-61 Black Widow, which was designed as a night fighter from the first, and proved highly effective.